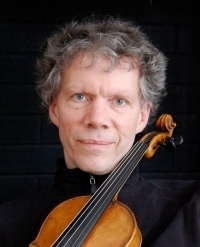 Mathias Tacke was the second violinist of the acclaimed Vermeer Quartet, Chicago from 1992 until 2007. He is Professor of Violin and Chamber Music at Northern Illinois University and Guest Lecturer for String Chamber Music at Northwestern University. Mathias Tacke was appointed Concertmaster of Camerata Chicago in the summer of 2008.He will undertake his new position beginning in the fall of 2008. With the Vermeer Quartet Mathias Tacke gave performances in practically all of the most prestigious festivals, including Tanglewood, Taos, Ravinia, South Bank, Lucerne, Berlin, Schleswig-Holstein and Edinburgh, to name a few. Three of the Vermeer Quartet recordings were nominated for the Grammy Award. Mathias Tacke appears internationally as a soloist and chamber player, performing a wide range of repertoire from the Baroque to music of our time. A native of Germany, Mathias Tacke studied with Ernst Mayer-Schierning in Detmold, Germany, with Emanuel Hurwitz and David Takeno in London, and with Sandor Vegh in Prussia Cove, Cornwall. He won first prize in the German National Youth Competition and graduated from the Musikakademie Detmold, where he was later appointed to the faculty. From 1983-1992 Mr.Tacke was a member of the Ensemble Modern Frankfurt, one of the most important professional groups specializing in the performance of contemporary music. In this capacity he gave countless first performances, including works by most of today’s leading composers. He has made numerous recordings for such labels as Sony, ECM. Harmonia Mundi, Naxos and Cedille. on November 17, 2012 at the Wheaton College Artist Series.